After sending out 40-odd emails requesting work experience and getting 1 response- it's now 3 and counting- rather than be saddened at the low response rate I was relieved I'd managed to secure a work experience and very excited to start my placement. 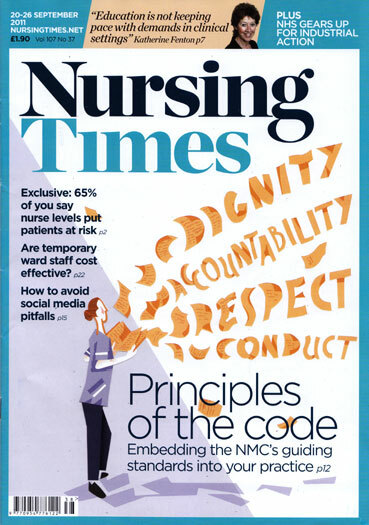 Yesterday, marked the end of my 1st week at Nursing Times Magazine (NT) and I thought I'd blog about how the experience has been so far. On my first day I got to meet some of the team including the lovely editor (Jenni), Fran (Assistant Practice Editor/ Deputy Online Editor, Ibadete (Book Editor) and Steve (News Editor). I was tasked with coming up with article ideas for the 'Student Nursing Times' (SNT) website and then writing them. During the week I've written blog pieces for SNT and have completed an article due to be published in next week's edition of NT (my first byline-Yippee!). Next week I shall be writing precises, more blogs for the SNT, and perhaps another article for the NT mag, if God permits. All in all I've thoroughly enjoyed my work experience at NT so far. I find most of the staff friendly, and am extremely grateful for the amount of writing opportunities I've been given. I'd deffo recommend this placement to anyone looking to develop their writing skills, as there are a lot of writing opportunities available providing you show ability and potential. You might have to do the odd typical intern stuff such as running errands, or photocopying, but these are occasional and for the most part your time will be spent writing. If anyone is looking for magazine work experience or media work experience in general, be sure to check out my work experience listings page here.